Interface Gallery is pleased to present almost (IS) is, an exhibition of new work by Teresa Baker and Jaimie Healy. 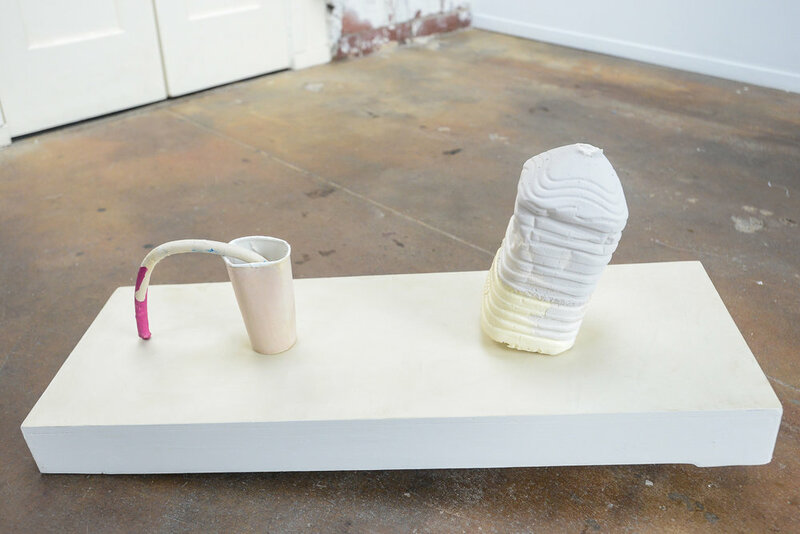 Healy and Baker both merge sculpture and painting in their practices in inventive ways, incorporating mundane, odd and even ugly materials in simple, expressive gestures. They allow raw, unfinished qualities to express a potent space between formlessness and form. Both artists' processes are highly intuitive as they seek a state where their work “almost is." For Baker, this is the moment in her process when her work just begins to take on it's own formal presence, to evoke something concrete, yet it is stopped there and thus remains open. For Healy, there is an intentional desire to produce a feeling of the work being unresolved–as a poetic gesture and a philosophical stance in favor of irrationality and intuition. For both artists, "almost" is a moment filled with expressive potential. This exhibition will involve an installation of the artists' paintings and objects in conversation with one another. A book about Healy and Baker's work–with an essay by Suzanne L'Heureux–will also be released.